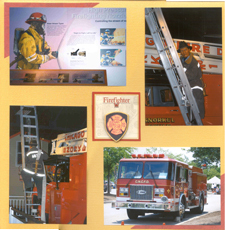 The photos on these Firefighter Scrapbook Layouts were taken at the North Charleston & American La France Fire Museum in North Charleston, SC. I personally don't have a Firefighter in the family, but I wanted to pay my personal tribute to these special Heroes. For all of these layouts, I mixed the papers in the Firefighters kit with some Yellow, Red, and Ivory papers from my stash. 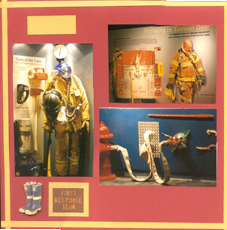 For the Firefighter Scrapbook Embellishments on this front page layout, I used the the brochure from the museum and a mural size photo on the inside wall of the museum. The layout on the left uses red Card Stock cut for mattes, and two 1/2 inch wide paper ribbons on the side. The stickers, one flat and one of the Clearly Yours Stickers, are both matted on a small piece of Ivory. The layout on the right uses 2 pieces of the Red Card Stock to make corner mattes for two of the photos - an interesting thing to do if you don't have enough for 2 full size mattes. 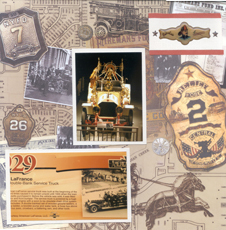 The Firefighter Scrapbook Embellishment in the center was cut from the paper kit packaging with a shield from the Grand Adhesions 3-dimensional stickers. For the layout on the left, the border around the outside was red, but I cut it off 1/4 inch all the way around and used it on top of a Yellow Card Stock. The red paper "ribbons" will be used on another layout. The layout on the right uses yellow 1/4 inch wide ribbon strips to make a similar border around the outside of the page. 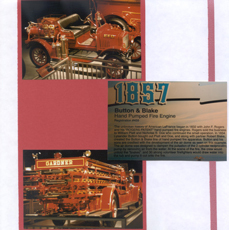 These two Firefighter Scrapbook Layout focus on the Antique Fire Trucks and uses the photos of the older trucks because of the heritage type paper on the right side. These photos are matted with the Ivory and Yellow, using one of the Clearly Yours Stickers that had a heritage look. 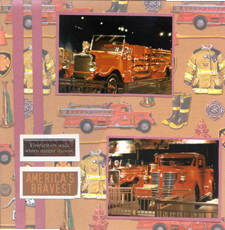 For these two Firefighter Scrapbook Layouts, I only had one of the printed pages left. So I paired it up with 2 of the Ivory Card Stock and cut the patterned paper, purposely crooked, to use on opposing corners. 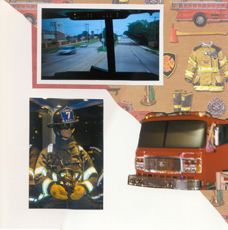 The layout on the right again uses a red corner matte and the fire truck photo was cropped and placed as if it was coming in from off the page. 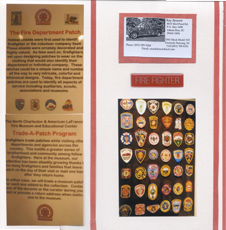 This Firefighter Scrapbook Layout on the left uses photos of the Fire Department Patches that are items to trade between departments and personnel. I have been in several fire stations over the years and this is a common occurrence. This is where I used 3 of the red paper ribbon stripes cut from the Firefighters page. 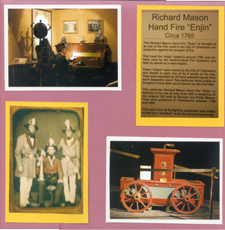 The card on the left is a business card from one of the Firefighters that guided me through the Museum and has a photo of his personally owned Fire Truck! I used this in the layout as I was very impressed with what he told me and I wanted to remember his name. The page on the right uses the 4th ribbon strip and a wide piece of the red card stock which is 6 inches wide. Getting to see this Memorial in Central Missouri on 9-11-2010 was a very moving event for me. I had heard about it just before dedication and had planned some time to see it, but I was there strictly by accident. My children and my spouse. 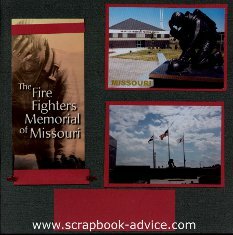 You may contact the Fire Fighters Memorial Foundation of Missouri at PO Box 151, Kingdom City, MO 65262 or on the web at www.FFAM.org. I hope you can use some of these ideas and layouts for your own to honor those special Heroes. 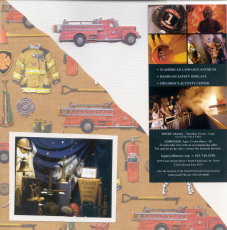 And if you have a local Fire Museum - go take a visit. This was very interesting and very informative. 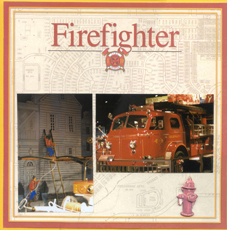 I had fun sliding down the Fire Pole and taking the interactive ride in the Fire Truck. I got to be a kid again for a few more minutes. 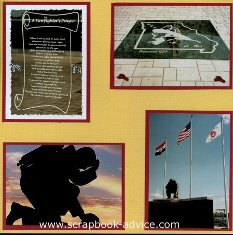 Or, if you have a Fire Fighters Memorial in your town or an event to honor local heroes, go and take some photos and do a couple of Firefighter Scrapbook Layouts to honor those who serve us. 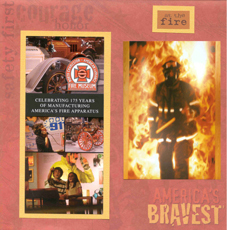 for Unique Firefighter Supplies & Gifts.